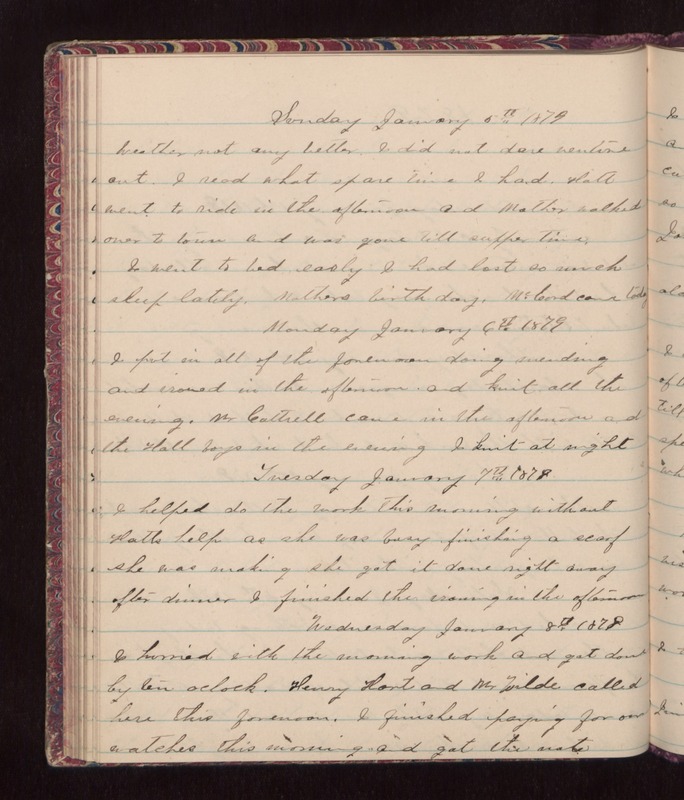 Sunday January 5th 1879 Weather not any better. I did not dare venture out. I read what spare time I had. Hatt went to ride in the afternoon and Mother walked over to town and was gone till supper time. I went to bed early I had lost so much sleep lately. Mothers birthday. McCord came today Monday January 6th 1879 I put in all of the forenoon doing mending and ironed in the afternoon, and knit all the evening. Mr Cattrell came in this afternoon and the Hall boys in the evening I knit at night Tuesday January 7th 1879 I helped do the work this morning without Hatts help as she was busy finishing a scarf she was making she got it done right away after dinner I finished the ironing in the afternoon Wednesday January 8th 1879 I hurried with the evening work and got done by ten oclock. Henry Harte and Mr Wilde called here this forenoon. I finished paying for our watches this morning and got the note.